Portable Bluetooth wireless isolating ear-insert sports earphones that come with six pairs of ear pieces in various types and sizes, three pairs of removable ear bowl supports in various sizes, a charging clip/battery pack, a USB charging cable, and a carrying pouch. The Jaybird Freedom F5 portable Bluetooth wireless sports earphones have an isolating ear-insert design. These earphones are intended for use with Bluetooth enabled audio devices including cell phones and have a claimed wireless reception range of 30 feet. They have a built-in microphone and integrated Bluetooth volume, music player function, and call connect/disconnect controls. The Freedom F5 is claimed by the manufacturer to be water resistant and comes with six pairs of ear pieces in various types and sizes, three pairs of removable ear bowl supports in various sizes, a charging clip/auxiliary battery pack, a USB charging cable, and a carrying pouch. It is covered by a 12-month warranty. 2.4 GHz transmission frequency, Bluetooth wireless, around 30 ft. operating range. Charging clip/rechargeable Lithium-polymer aux battery pack is used for headphone charging, can be charged independently while the headphone is in use, and can be clipped on to the headphone to extend battery life. Operates up to 4 hrs. on built-in rechargeable Lithium-polymer batteries without charging clip/aux battery pack or up to 8 hrs. with charging clip/aux battery pack attached with a charge time of 2.5 hrs. Has battery recharge indicator. Manufacturer claims water resistance. Has pairing memory for up to eight Bluetooth devices. Has Multipoint feature - allows simultaneous connection of two Bluetooth devices (to switch between connected devices stop sound on device and start sound on the other). Has Sharing feature - can be Bluetooth connected to a second Freedom F5 to allow both earphones to hear the same Bluetooth source. Has power on/off, Bluetooth pairing and battery status voice announcements. Bluetooth connected Apple mobile devices using iOS Version 5 and above will show the battery level. 20 minute partial charge will power earphones for up to 2 hrs. (1hr. for earphone + 1 hr. if charger clip/battery is left attached). 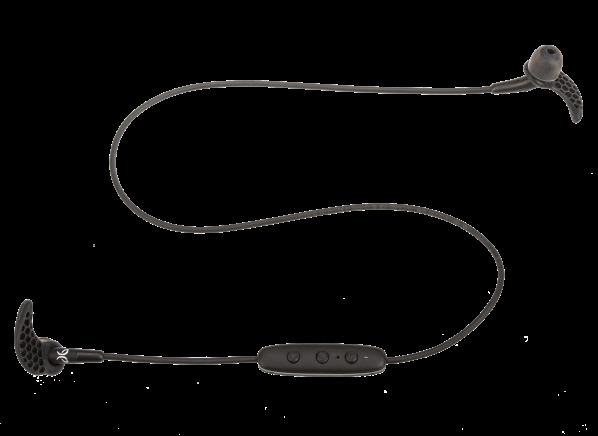 Free Jaybird Mysound app download for Apple or Android mobile devices can be used to change the sound of the earphones. Six pairs of ear pieces in various types and sizes, three pairs of removable ear bowl supports in various sizes, charging clip/battery pack, USB charging cable, two removable cable shortening clips, removable clothing clip, carrying pouch, free Mysound app download for Apple or Android mobile devices.